As a major shareholder in BusinessNZ, Business Central, together with the other regional organisations makes a significant contribution to the important work of this peak body. BusinessNZ lobbies the government on a daily basis on the wide range of issues which affect our business members and the economy at large including tax, trade, interest rates, compliance costs, infrastructure, energy and education. Because of our expertisecovering a range of employment issues, Business Central is a major player in the area of employment policy advocacy. 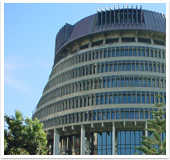 Business Central and BusinessNZ staff are well placed to help with research and analytical expertise to reinforce members' lobbying activities.